Seasonal cooking is the best. There’s always some sort of ingredient I look forward to as the changing of the seasonal guards occur. In fall, I look forward to butternut squash and utilizing the gourd to make my mom’s butternut squash soup (it’s my favorite way to kick off my favorite season!) Brussel sprouts top my list in winter. Spring delivers delicious asparagus and signals the beginning of the return of berries. Summer, a crowd favorite, boasts corn, cherries, and peaches. But, the stars of my summer ingredient list have to be tomatoes and fresh herbs to make pesto. Tomatoes and pesto go together like peanut butter and jelly. 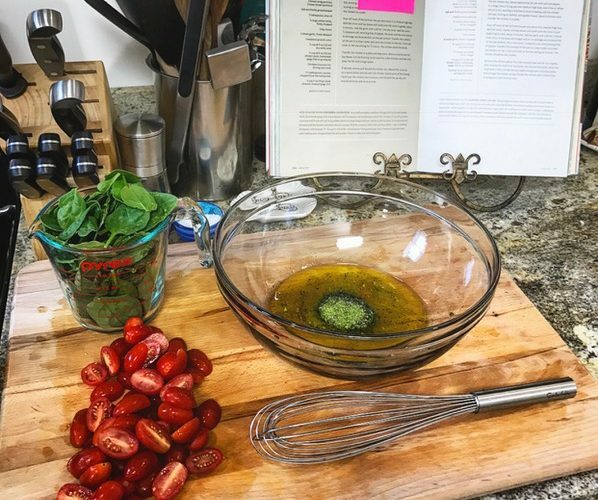 For me, there is nothing better than pairing fresh pesto with a perfectly ripe tomato (my mouth is watering as I type this.) Pesto and tomatoes really are the perfect combination of fresh ingredients and show off what summer is all about when it comes to food. 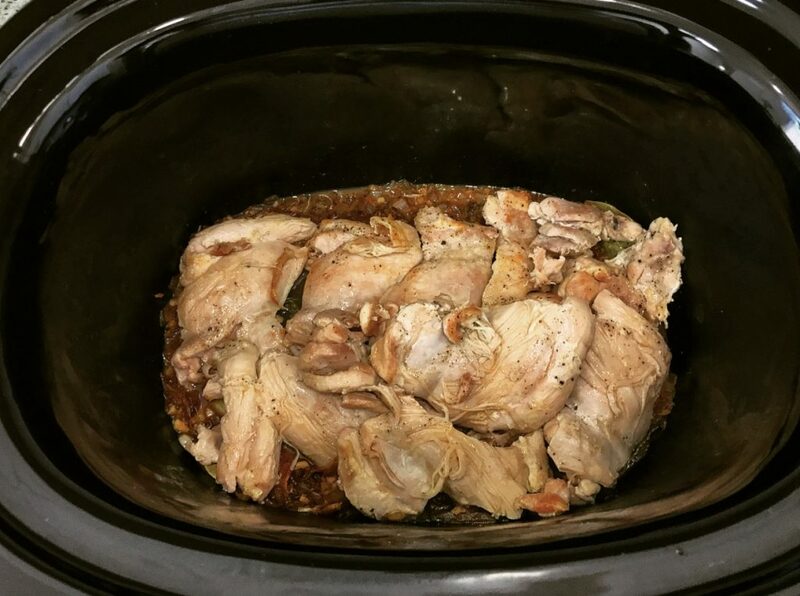 Lately, my crockpot has been my best friend on Sundays. It’s a great tool to help break up your time in the kitchen if you meal prep to get ahead of the workweek hustle and bustle. Sundays are also my long run days for half marathon training and knowing a delicious meal will be waiting for me is light at the end of my several mile tunnel. Not to mention, having that box checked helps me to have a guilt and stress free run. 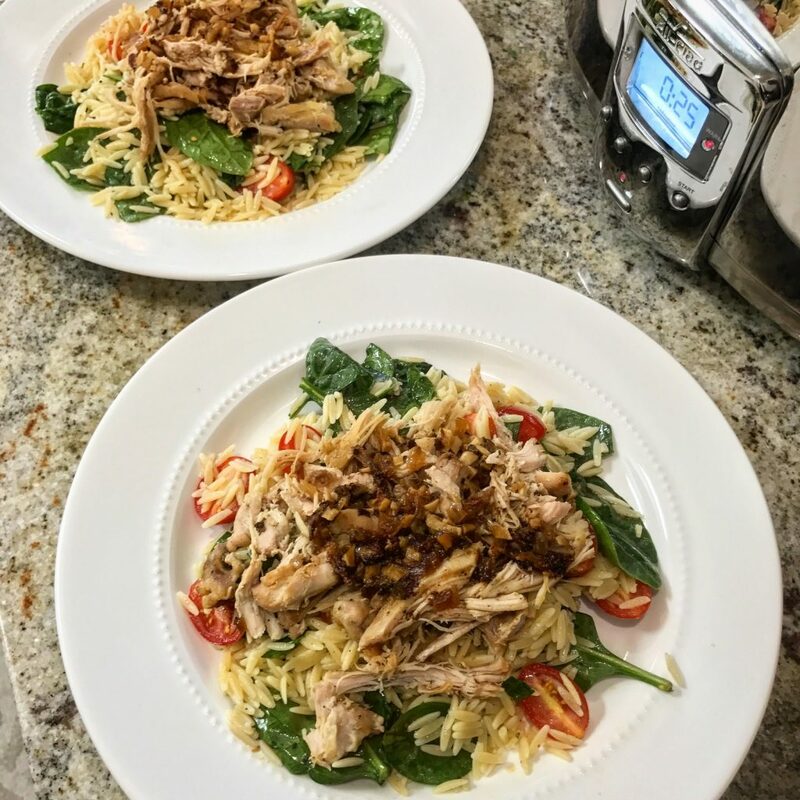 Last Sunday, I made one of my favorite crockpot and summer recipes— braised chicken and summer orzo salad— and received numerous requests for the recipe, so wanted to share. The recipe is delicious, light, and shocker, utilizes tomatoes and pesto. The first time I made this recipe, I used pesto we picked up on our honeymoon in Italy. I don’t think the recipe will ever quite taste as good as it did then, but the meal is tasty regardless. The recipe calls for you to make your own pesto, but don’t feel bad if you prefer to buy a batch. 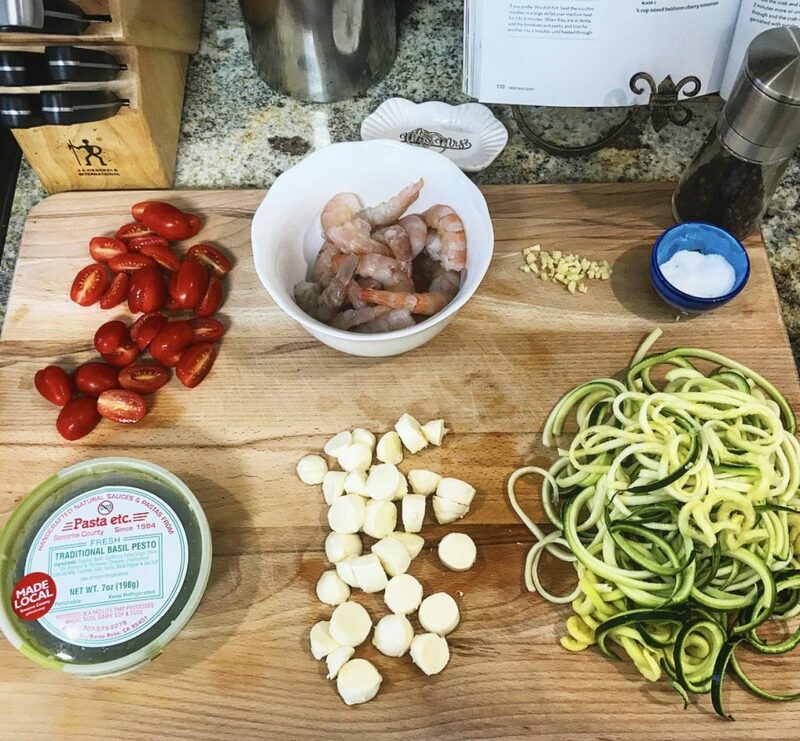 Secret between us— I used store bought pesto last Sunday because I needed to save time to get out the door for training. If you go the store bought route, buy locally made pesto, if possible. I picked mine up from Whole Foods from the locally made section or you can visit your local Italian market. No matter if you buy or make your own pesto, there’s great news— you only need a tablespoon for this recipe, so you’ll have plenty of leftovers for easy and mouth watering meals throughout the week. Hope you enjoy the recipe as much as we do! This recipe can be found in Williams-Sonoma’s The New Slow Cooker Cookbook. 1. Pat the chicken dry. Season generously all over with salt and pepper. 2. In a large, heavy frying pan over medium-high heat, warm the oil. When the oil is hot, working in batches to avoid crowding, add the chicken and sear, turning as needed, until golden brown, about 8 minutes total. Transfer the chicken to a plate. 3. Pour off most of the fat from the pan and return it to medium-high heat. 4. Add the onion, thyme, and bay leaves and sauté until the onion is just beginning to color, about 5 minutes. Add the garlic and cook for 1 minute more. 5. Pour in the wine and vinegar and stir to dislodge any browned bits on the pan bottom. Stir in the stock, ½ teaspoon of salt, and several grinds of pepper. 6. Transfer the contents of the pan to a slow cooker and stack the chicken on top. Cover and cook on the low setting for 4 hours. The chicken should be very tender. 7. Remove the chicken pieces from the braising liquid and let cool slightly, then remove the meat from the bones, and discard the bones. Shred the meat with two forks. Divide the orzo salad among warm individual plates, and arrange the chicken on top. Drizzle the chicken with a little of the braising juices and serve at once. 1. Bring a large saucepan three-fourths full of salted water to a boil over high heat. Add orzo, stir well, and cook until al dente, according to package directions. Drain. 2. In a large bowl, whisk together olive oil, white wine vinegar, pesto, salt, and several grinds of pepper. 3. Add the orzo and toss to coat evenly. 4. Fold in cherry tomatoes and baby spinach. Looking for a delicious dish to steal the show at the next BBQ you go to? Check out my two favorite pasta salad recipes here.